The model has a number of movable parts, including the Countach's iconic scissor doors. The model faithfully replicates the Iconic Lamborghini, the whole body is diecast which adds great weight to the model, it weighs over 7kg! Référence Fabricant : PHK109. - Type : LAMBORGHINI HURACAN LP 610-4 - 2014. - Fabricant : POCHER. - EAN : 0660042343284. Fahrzeug : LAMBORGHINI HURACAN LP 610-4 - 2014. - Marke : LAMBORGHINI. Modellbezeichnung : Lamborghini Countach. Erstickungsgefahr, da kleine Teile verschluckt werden können. Zustand : Neu & OVP. Farbe : rot. Référence : HK109. Lamborghini HURACAN LP610-4 . Fabricant :Pocher. Couleur :Verde Mantis. Expédition de l'objet en Point Relais "Mondial Relay" ou Colissimo avec numéro de suivi. Hk109 Lamborghini Huracán Verde Mantis, 1:8 Pocher Kit Construcción. 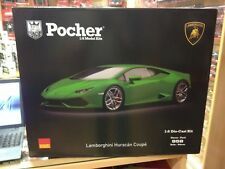 HK109 Lamborghini Huracán Verde Mantis, Kit de Pocher 1:8. Maßstab 1:8. The stunning Lamborghini Huracan. The Huracan (Spanish for hurricane) is Lamborghini's successor to its massively successful Gallardo, and made its debut at the 2014 Geneva Auto Show. We all have different perceptions of what the future will bring. Wheels/axles straight. If required, a sensible resolution is usually possible. Model is 100% complete, 100% original and in superb condition. No fading/discolouring to card. Very bright, clean and solid. 1/18 Scale Model by MONDO. Scale 1/18. Ending Soon. New Arrivals. The RM Toys Team. Kind Regards. Our aim is to ensure no matter what the model, we will provide an excellent service experience. GRADING CONDITIONS. The model is Mint on a (UK) Short Card. Scale 1/18. Ending Soon. New Arrivals. The RM Toys Team. Kind Regards. Our aim is to ensure no matter what the model, we will provide an excellent service experience. GRADING CONDITIONS. Material Diecast. We have a great range of Bburago cars with scales ranging from 1:18, 1:24 & 1:32. We are here to help! Highly detailed scale model. Functional moving parts. 1/18 Scale Resin Model by GT Spirit. Scale 1/18. GOOD - The item will have had more use, showing obvious imperfections. EXCELLENT - The item will have had very careful use, with only small imperfections. 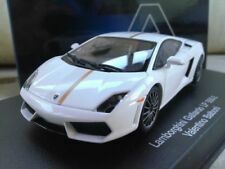 1/18 Scale Diecast Model By Anson Models30302-W Lamborghini Muira YellowThe Model Is In Mint Condition The Box Is In Excellent Condition - Slightly Worn. 1/18 Scale Model by ANSON. Scale 1/18. Ending Soon. 1/18 Scale Diecast Model By Ricko Models32141 Lamborghini Countach 25Th Anniversary 1989 - SilverThe Model Is In Mint Condition.The Box Is In Fair Condition - Worn. 1/18 Scale Model by RICKO. Scale 1/18. Scale 1/18. The MODEL is in the following condition - MINT. The BOX is in the following condition - MINT. Our aim is to ensure no matter what the model, we will provide an excellent service experience. 1/18 Scale Model by MONDO. Ending Soon. New Arrivals. The RM Toys Team. Kind Regards. Our aim is to ensure no matter what the model, we will provide an excellent service experience. GRADING CONDITIONS. 1/18 Scale Model by KYOSHO. Scale 1/18. The MODEL Is In MINT Condition. The BOX Is In MINT Condition. Our aim is to ensure no matter what the model, we will provide an excellent service experience. Maisto 1 18 Lamborghini Diablo. Condition is Used. Dispatched with Royal Mail 2nd Class. Great looking model in excellent condition as you can see from the pictures. Thanks for looking!